Last summer I heard some crows making a huge racket outside on my porch so I ran outside to find one of their chicks behind a chair. I called the bird rescue to ask if I should bring her in, only to find that they had a huge overflow of crows. The woman on the other end of the line suggested that I make scrabbled eggs and use a toothpick to feed the bird. I know you must be thinking what I was thinking, why would a bird want to eat eggs? Gross, right? Well I did what I was told. Most of the egg landed on the ground. Then my husband came home and saw a cat trying to attack the baby crow and scared the cat away. The woman at the bird rescue center told me to put the crow in a bush high enough for the parents to see it. So we did that and within seconds the bird was gone. Crows are known to recognize faces and tell other birds whether a human is safe or not. Shortly after this incident a family of orioles settle in our backyard. I’m sure that the crows had something to do with this. 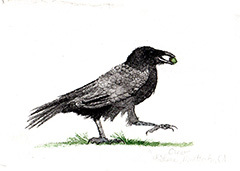 There are so many myths about crows, if you are interested just google crow mythology and be amazed!